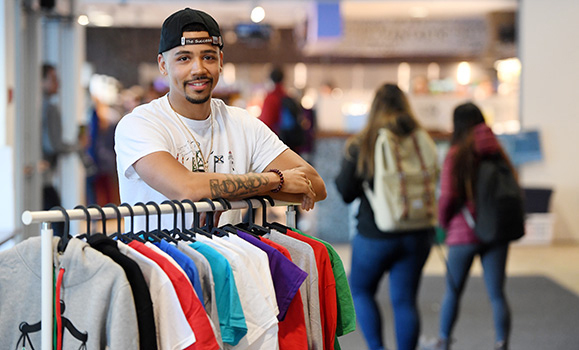 Management student Trevor Silver is busy setting up his tREv Clothing pop-up shop in the Student Union Building. 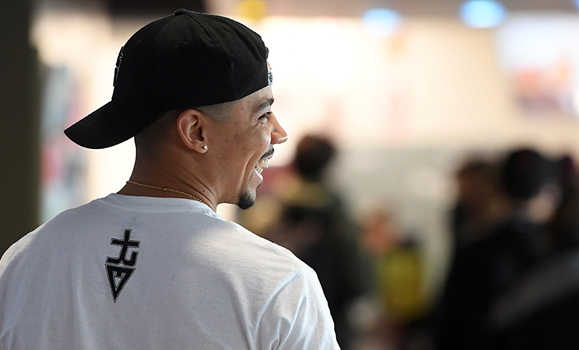 The booth is full of colourful t-shirts, caps and stickers featuring the core principles that have inspired and motivated him. “When I meet somebody I'll say, ‘Have you heard of the brand?’” Trevor explains. “I always have my hat, so I point to my hat and say, ‘It's T-R-E-V, which stands for trust, Respect, Educate, value.’ You gotta trust yourself, respect yourself, educate yourself and value yourself and others to succeed. And it says ‘success’ on the strap because if it's on your head, it's on your mind: success." These days, Trevor definitely has a lot on his mind as he balances business success with finishing his degree. Going to university wasn’t something Trevor ever considered while growing up. Then, his cousin went through Dal’s Transition Year Program (TYP) with the plan to pursue Architecture. At the same time, his history teacher began encouraging him to give university a try. When he got to Dal, Trevor had his heart set on studying Law. Because Law is a professional program, it requires previous university study so, after completing TYP, he chose an undergraduate degree in History in honour of Ms. Ryan. But he kept his options open — duing his first few years, Trevor took lots of different courses that allowed him to explore his varied interests. One of them was a Management course. For all intents and purposes, getting accepted to Law, meant Trevor had reached his goal. But after his first year of courses and a summer placement in a law firm, he started to realize that something wasn’t quite right. Fortunately, at this time, Trevor was also beginning to doodle designs. When he came up with a design that represented the crucial balance between work, money, career and family, love, friendship, he knew he was on to something. He decided to use the design he’d created for a chain a few years before as the logo and that’s when tREv Clothing was born. Now, back in Management, Trevor plans to finish his degree by 2020. He knows it’ll be a challenge to keep up with school while promoting the brand but he’s determined to make it work. While Trevor’s inspiration comes from home — from his grandfather, his cousins, his high school teacher — along the way he’s discovered that the drive for success really does come from within.